While many parents of kids with autism see improvements in their child’s behavior, attention, and hyperactivity when they reduce the amount of sugar in their little one’s diet, research does not actually support a link between sugar consumption and hyperactivity . Links between sugar and autism are also only speculative. Many children with autism react differently to food than typically developing children, and anything we put into our bodies can have an effect on how we feel. What we do know is that sugar promotes inflammation in the body. Children who eat lots of added sugar early in life are more likely to have obesity, type 2 diabetes, and high blood pressure, conditions that can lead to heart disease. Plus, sugary foods tend to be low in good nutrients, so filling up on sweet treats leaves less room in young tummies for nutritious alternatives. 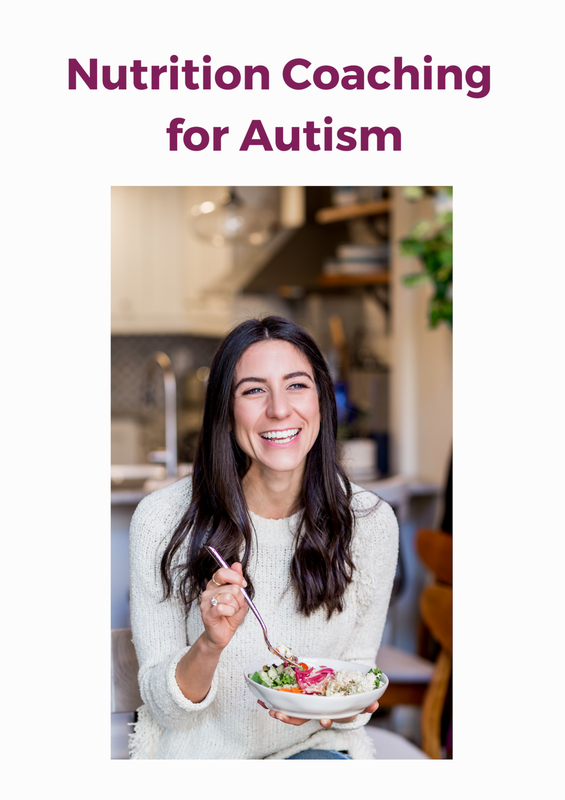 Additionally, we know that children with autism tend to be have lower intake of many essential vitamins and minerals, so it can be extra important to prioritize healthy foods in their diets. Many of the parents I work with come to me frustrated and confused about reducing sugar in their child’s diet. It feels like a daunting task, especially as sugar is added to nearly three quarters of packaged foods sold in supermarkets . Where do you start when sugar is everywhere? Try these 13 tips to reduce the amount of sugar in your child’s diet. Tackle these one at a time, starting with small changes and slowly progressing once the change begins to feel normal. Start either with a change that will have the most significant impact or at the one that will be easiest to implement. Kids love condiments like ketchup, creamy salad dressings, and barbecue sauce. These are often full of hidden sugars (that’s probably why kids love them so much!). Instead of buying high sugar options, make your own, read labels to find ones without added sugar, or try tasty alternatives like salsa, mustard, yogurt, pesto, and avocado dip. Restaurant meals, prepared foods, and packaged foods contain infinitely more sugar than the foods we make in our own kitchens. Consider fast food fries which can contain up to 20 ingredients, including sugar. Making baked fries at home can use as little as 3 ingredients. The benefits to cooking are endless. Cooking doesn’t have to be complicated, but it does take some time. Start by planning menus or setting aside a few hours to prep a bunch of food at one time. Baking in particular provides a lot of opportunities to save sugar. Swap some added sugar in baked foods for pureed fruits or veggies like applesauce or banana or pumpkin puree. These are two seemingly benign foods that have become notorious for being loaded with sugar. Save money and sweetness by making your own. Make big batches of sauce using canned tomatoes and freezing in easy-to-defrost portions. Dress salads simply with oil and vinegar or get fancy and make a creamy dressing using plain yogurt, mustard, or avocado. Sweet foods tend to be used as rewards or reserved for special occasions. This causes kids to think they’re more special than foods like fruit, vegetables, whole grains, and proteins that are meant to make up most of our diet. Treat sweet foods like any other and find alternatives for food rewards. Pick things your child will be excited about like favorite toys or activities. Out of sight, out of mind. Kids are flexible and they will easily adapt to the diet that you provide, however, they’re also prone to temptation. Limit your kid’s desire for sugary foods by keeping them off the counter, out of commonly visited drawers, and stashed away on high shelves. Sugar is in most packaged foods, especially ones marketed to children. Start reading food labels so you can be more informed about what you’re buying. I suggest looking at the ingredients list and grams of sugar. Sugar has many different names so beware of ingredients that end in “-ose” and remember that ingredients are listed in order of the amount included in the recipe, so if sugar is early in the list, it means there’s a lot of it. Flavored yogurts and oatmeals can have over 20 grams of sugar. Even though they’re nutritious foods on their own, once they’re processed they lose a lot of their wonderful nutritional value. Switch to plain. Add your own sweeteners like dried or fresh fruit, honey, or maple syrup. You can also try the 50/50 rule below. Making the switch to eating less sugar can be a big jolt for little kids with a big sweet tooth. Make the transition easier by slowly making changes. Swap pureed fruit for half the sugar in a recipe. Mix sweetened yogurt with plain. Incrementally reduce the syrup you’re adding to morning pancakes. Use only half a pack of hot chocolate mix, adding cocoa powder instead. We often resort to feeding our kids sugary packaged goods because they’re so easy. Break this habit and replace sugary foods with nutritious ones. Take a couple of minutes to cut fruits and veggies and store them so your kiddos easily see them when they open the fridge. Always keep fresh fruit on the counter and offer these first when kids are hungry. 95% of packaged cereals contain added sugar. Even the “healthy” ones are loaded with it. Some alternatives to cereal include: eggs, oatmeal, yogurt, smoothies, leftovers, frittatas, casseroles, sandwiches, pancakes, waffles. Kids watch and mimic what we do. Set a good example by eating lots of whole foods and limiting sweets in your own diet. The more your kids see you do this, the more normal it will seem. How often are you serving dessert? And what does it look like? If dessert is a nightly routine in your house, start swapping in some healthier options. Offer fruit and decrease the amount of sugary options provided. Start inviting your kids into the kitchen. Kids are more likely to eat foods they help prepare, so invite them to help with making some lower sugar treats. Good ideas are chocolate-dipped fruits, baked goods, and these fun sugar-free popsicles. Sugary foods don’t need to be available to your children all day long. You are in charge of what is offered, so don’t be afraid to set limits. Some families only offer sugary foods on the weekends. Others have a one sweet food a day quota. Others still reserve sweet foods to one special time, like a ritual ice cream run after school on Fridays. Limits may be tough at first but with consistency and time they will become normal. Water and milk are the only two beverages your kiddo needs. If your child is attached to juices or sodas begin reducing the number of times you make these drinks available during the day and try simple alternatives. Start watering down juice and slowly adjusting the ratio. Substitute seltzer water for soda. To recap, your child will likely experience many benefits from reducing the amount of sugar in his/her diet. Try these tips above. Start slowly by picking just one and add from there. Feel like you need guidance beyond what an article can offer? Get in touch. I’m accepting new clients. Want to read this article later? Save it to Pinterest.